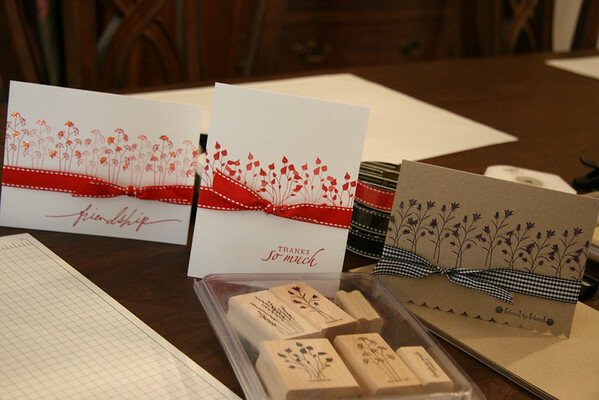 Saturday afternoon I hosted a little Stampin' Up! shindig and thought I would share the make and takes with you too. 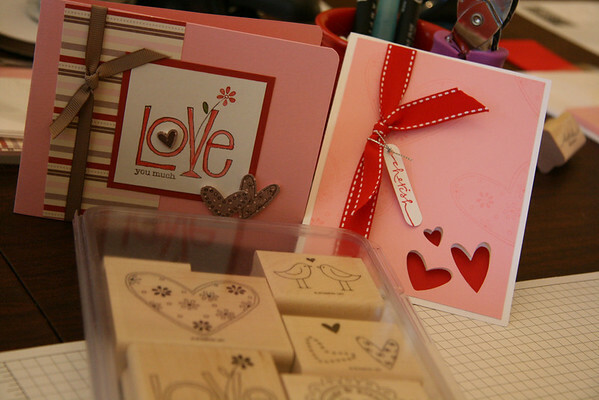 The first few cards were made using the Pocket Silhouettes set. The repetitive image across the paper is very simple yet striking. Tie a coordinating ribbon and you are done. If you want to step it up a bit you can add brads, a scallop border or a touch of glitter to the flowers. Embossing is another option to add a bit more Oooh Factor. This set offers lots of options not only for Valentines, but weddings and anniversaries too. 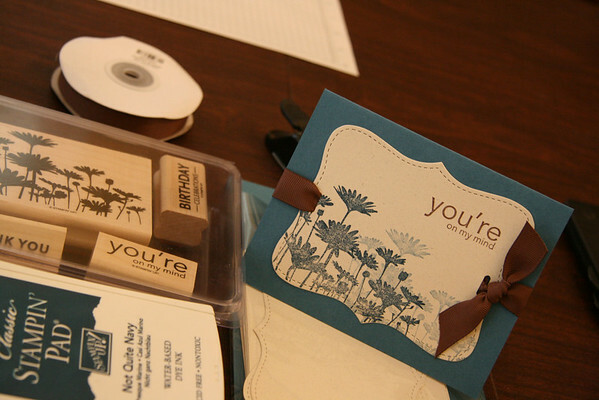 I am a big fan of paper punches since they are quick and versatile. I used the word window punch for the cherish tag and the trio of hearts punch as well. Coordinating pattered paper also adds a little pizzazz. Hosting this little card party gave me the perfect reason to play with The Big Shot. Yippee! 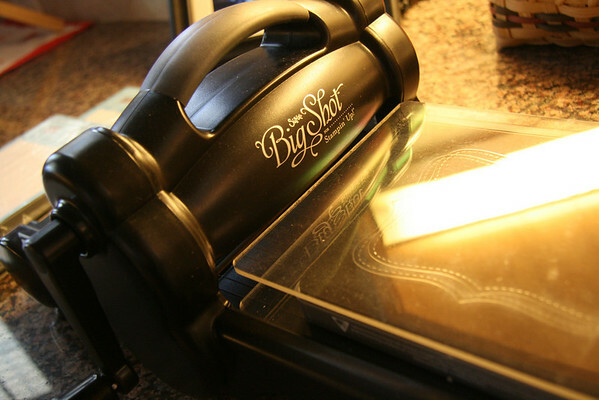 It not only die cuts, it dry embosses too (it might even bake you a cake).This opens up a whole new crafting world to me that honestly seems a bit overwhelming since I'm still rather new to die cuts, etc. Ta Da! 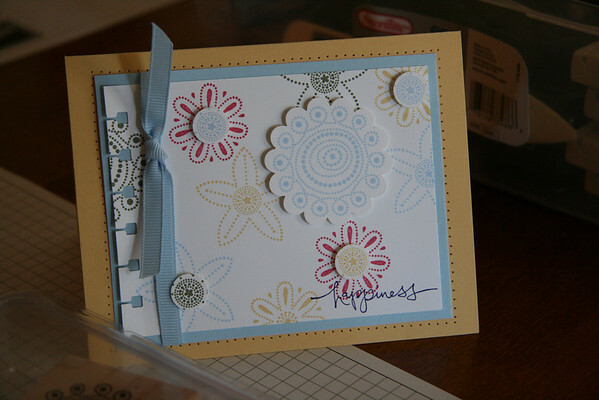 I think this one was my favorite because it was deceivingly simple and used the very versatile Upsy Daisy stamp set. You could step it up with brads, emboss the image or layer the word phrase if desired. This card was very simple too with a few added touches of paper piercing, Stamping Dimensionals and a spiral punched edge. Several of the hand held punches coordinate with this stamp set also. There you have it, a handful of handmade cards in a short amount of time. Add a few girlfriends, some snacks and you have the makings of a highly enjoyable afternoon! Did you happen to notice the rather big kid included in the mix? Um...yeah, Scott had a lot of fun too. You've got serious skill here! I love the cards!!! I have been in a crafty mood too lately! Your ideas for cards are so wonderful! I bet the girls that were there were not disapointed with all you crative ideas!!! 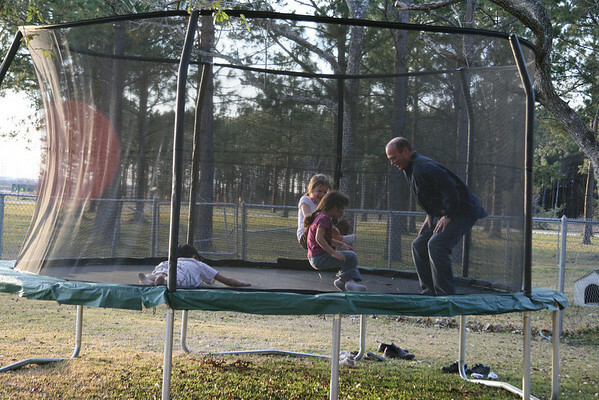 Ok, seeing the trampoline picture with Scott on there sent chills up my back and a re-visit to "our families" broken leg incident!! Please...Oh, please be careful! However, with that said- could Scoot come babysit? WOW! I love those cards! THose cards are so lovely Holly! I'm not sure I could ever make something that crafty of the card variety! Love them! And so glad all the "kids" had fun! I hope you had a good time with your friends! Really love the cards! Don't you love that Big Boss? I have the Cuttlebug and it's the same sort of thing. Those cards are just ADORABLE. Love them all. I love making cards! Yours all turned out great. I really should dust off my stamps and use them soon. Now this is my kind of party! It's hard for me to choose a favorite - I love all of yours! Great cards! I need to get out my supplies. Had a blast on Sat! Thanks for the SU inspirations! And the best part was all of the popsicales and jumping - by all 4 kids! just beautiful!! i love them. Thanks for getting my card-making brain all fired up again. I have already copied some of those card ideas, and they turned out great! I had fun on Saturday. Now I want to make some too!